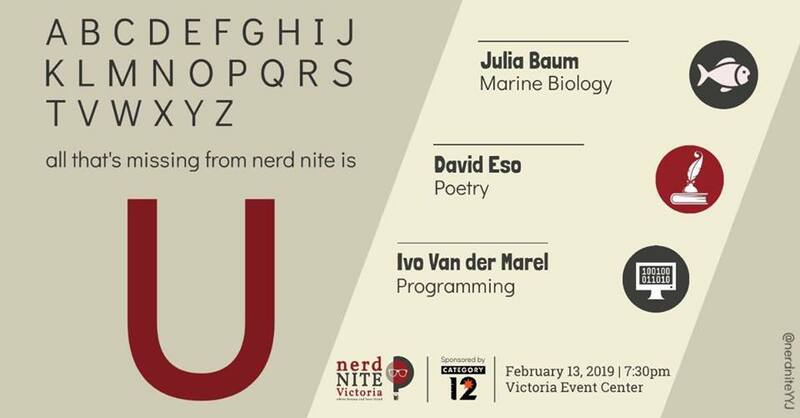 Nerd Nite Victoria is back in 2019 with many more interesting and intriguing talks! Join us for another exciting evening in February where enthusiasts talk about their passion in the company of beer in an informal atmosphere. Our audience consists of anyone who is interested in science, geeky subjects and other passions. Doors open at 7.00 PM, opening at 7.30 PM. * This is a non-profit event. All income from the entrance fee goes to the rent of the venue and organizational costs. – The Victoria Event Centre currently does not have an operational elevator, and there is one long flight of stairs at the venue entrance. If you would like to attend the event but require assistance with accessing the space, please contact us at events@victoriaeventcentre.ca and VEC staff do their best to accommodate.